In just about every area of prepping, we like to use a three-layered approach, moving from simple and easily available preps to more serious long-term solutions. This approach keeps us from being overwhelmed by the enormity of purchases we need to make or knowledge and skills that we need to acquire. It also moves us forward in our preps in a logical and balanced way. Preps for Immediate Use. Usually, the things that fall into the immediate use category are also the easiest to purchase and least expensive. For the most part, these first-level preps are the things that we are already using in our everyday lives. The only difference is that we have more of them on hand than what our current daily needs would require. For example, in the area of water, our immediate use water is store-bought bottled water. We use some bottled water on a routine basis, but we have a bit more than we really use stacked up under a work table in our basement for when special needs arise. You can easily build up this kind of water supply by purchasing a few cases when you go shopping over the next couple of months. We’re in the process of building up to about a week’s supply of water in bottled water. 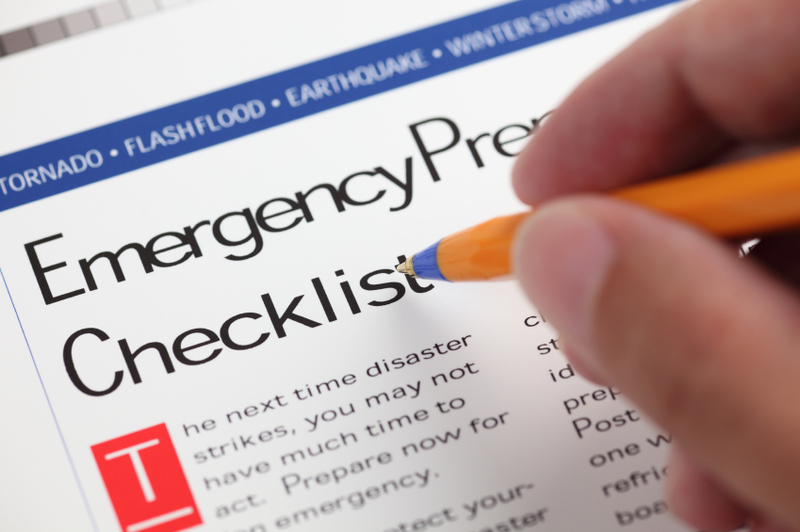 In an emergency or any unusual situation, this first layer of prepping buys you time to evaluate and adjust to your situation before you have to begin living in a way that you are not so familiar with. In a true emergency, everything changes. Anything you can do to add normalcy to your life brings a level of calm to your world. Grabbing a bottle of water is something we do every day. Having extra bottled water stored away allows me to continue living as I have been while I figure out how to live in a new way — and I don’t have to run out and buy anything because I already have it on hand. Preps for Medium to Long-term Use. 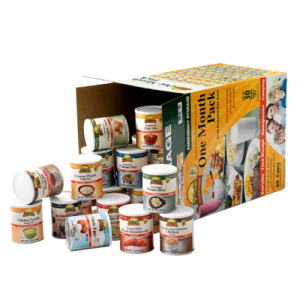 This second level of preps are things that you don’t typically use every day under normal circumstances, but they can help you sustain a normal lifestyle when your normal lifestyle becomes disrupted for more than a few days. 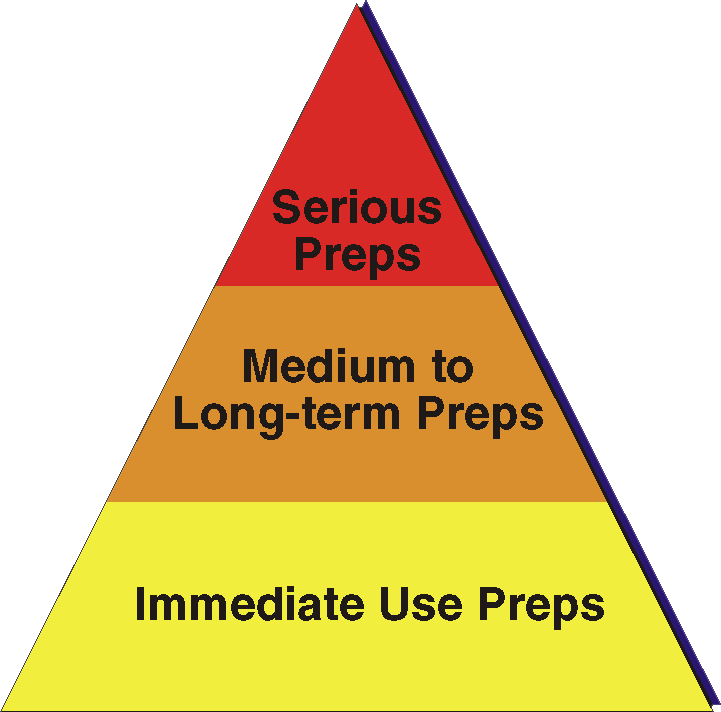 These types of prep generally require a bit of thought and planning to determine what your needs are and what your best approach is to meeting those needs, and they usually cost a little more than the things you buy for day-to-day use. This is the level where prepping really starts to become an intentional lifestyle. Buying extra bottled water is a no-brainer for someone who typically uses bottled water as a convenience product, but this second level of prepping is where you start to acquire things that you won’t be using on a routine basis. These are things that you will have on hand in the event that you find yourself in a situation in which your normal way of life is disrupted and the stuff you keep in your cupboard isn’t enough to get you through it. Sticking with water as our example, we have purchased a set of five-gallon, food-grade, stackable water containers that we fill and rotate regularly. We don’t drink from them during normal times. That’s not what we bought them for. These containers required a little more investment than the cases of water and it takes some time to fill them, but if we find ourselves in a second-level situation that requires more than just a couple of spare cases of bottled water to get us through it, we’ll be glad that we have this on hand ready to meet our hydration needs. Preps for When Things Really Get Bad. Then there’s the third layer of preps – those we make for when things really get bad. Those preps are the ones that will sustain you for a longer time. In the area of water, we recently invested in a small, portable Katadyn water filtration device that can purify up to 13,000 gallons of water to safe drinking standards. We’re talking about water from a stream or pond or rain barrel. This device is about the size of a tall thermos jug and could be easily carried in a backpack. 13,000 gallons of drinking water is enough to meet our needs for a great long while. We have plans for installing a rain barrel system on our house this coming spring that will provide free water for watering our garden and could help supply drinking water in the event of a level-three emergency. I Love It When I Get To Use My Preps! We recently experienced a boil alert in our community. The city put up signs at intersections in our neighborhood that told us they were working on the water lines and that we would need to boil our water to make it safe for drinking. That was an understatement if there ever was one! The stuff coming out of our pipes (I’m not sure I’d call it water) was brown and nasty looking. How brown was it? Think strong iced tea. Yeah, that kind of brown. Phil left for work shortly after we learned of the alert and noticed the alarming color of the water coming out of our tap. That left me home to deal with living with no water. Intrepid prepper that I’ve become, my first reaction was to wonder what in the world was I going to do for water over the next indefinite period of time. All of a sudden, I wanted water. I don’t drink nearly as much of it as I should on a regular basis, but knowing I couldn’t have any really increased my desire for it. I mean I couldn’t drink Diet Coke exclusively for the next few days, so what was I going to do? Tea was my next option, but the water was so yucky I really didn’t want to drink any of it even if I had boiled it! Boiling this stuff wasn’t really going to make it clean and safe — just hot. Yeah, I’m still new at this. My prepper instincts didn’t kick in right away. But it wasn’t long before my newly minted prepper training kicked in. I remembered those cases of bottled water we have stored under the work table in our basement. For the three days that our water was questionable, I had all the water I could ever want available in those cases of bottled water. And if it went longer than those three day, I could refill the bottles of water from our five-gallon jugs. And if we started to run low on that, we could refill the five-gallon containers with water from our Katadyn water filter. This short-term inconvenience allowed me to use some of my first-level preps in a real-life (albeit non-emergency) situation. And it reinforced one of the main reasons we prep – so that we can take the “emergency” out of the emergency. My emotional state changed from nervous to totally calm and even confident – simply because I had stored water. In a true emergency, knowing that you have what you need to survive allows you to remain calm and puts you in a position to help others. That’s why we prep. Clean water may not be available in an emergency. Storing water now assures your survival because people can only live a few days without pure, clean water for drinking, cooking and hygiene. Knowing how much to store is the first step. You’ll find the answer here. But knowing how much to store and actually storing it are two different things. So you really can consider your bottled water a part of your water storage plan. But somehow I don’t feel as good about it as I do my true long-term storage water. So I am more diligent about rotating my supply of bottled water. I don’t drink a lot of bottled water. (Phil and I have done blind taste tests and found that we like tap water as our favorite most of the time!) But I keep several cases on hand and every now and then grab a bottle as I’m leaving the house. That causes a natural attrition to my stored water and as one case gets about half empty I buy another. Easy-peasy start to any water storage plan. What do I store it in? For true long-term water storage, the best option is to food-grade quality containers that have been made for storing water. (OK, I admit it – until a year ago I didn’t know they had such things!) Phil did some research and price checking and we bought ours from TheReadyStore.com. Prepper Tip 1: Be sure to buy spigots for your containers. They come with screw-top lids, but they don’t come with spigots that make it easy to dispense the water. They only cost a couple of bucks each and you don’t have to have one for every container. Just one for every container that you’re currently serving from and maybe one or two as back-up units. We didn’t think to add them to our container order and then had to pay separate shipping costs for the spigots. I learned the value of having a spigot when we had a water outage during Super Storm Sandy. Phil was out of town, and I stared at stacks of 5-gallon containers of water with no easy access to their contents. Needless to say I was thankful for my bottled water collection for those couple of days. Prepper Tip 2: Phil added this tip when he edited my article about how much water to store – “Large water barrels and tanks are great, but for the sake of mobility, a 5-gallon container is the largest size that most people can move or carry without excessive strain.” You can buy water storage drums and tanks of varying sizes. The Ready Store has tanks up to 500 gallons (if you want to shell out almost $1,300 for one). That’s a lot of water, but you aren’t ever going to be able to move it. How do I store water? Our containers came with instructions about how to prepare them for use, which was really nice simply because it meant we didn’t have to find that info (even though it’s all over the internet). Basically, you’ll want to wash, sanitize and rinse the containers with warm soapy water and unscented bleach. Wash the container with the warm soapy water, rinse it thoroughly – you’re done. Sanitize the container by adding 1 teaspoon of liquid bleach to 1 quart of water. Pour it in, shake the container vigorously, let it sit for a minute or so, then empty the container. Either let the container air dry or rinse it thoroughly with clean water. Prepper Tip 3: Store unscented liquid bleach near your water to use in purifying it if necessary. Where do I store water? A cool dry place. Think basement. It’s not so much for the sake of the water as it is for the protection of the plastic container that the water is kept in. Are not made of glass (they break too easily and they’re too heavy). Have never held a toxic substance (if you’re not sure, don’t use it). Are not milk cartons or bottles (they’re too difficult to get clean and they may not seal tightly). Do not have a #7 recycling symbol (these bottles are made with polycarbonate plastics and should not be used for water storage). Are not used pre-packaged water bottles (these bottles are made for one-time use). In the realm of prepping, storing water is not only the most important, but also the easiest and least expensive part of your emergency preparations. Set aside a few dollars and a few hours and you’ll be able to store enough water for you and your family for most emergencies you’ll face. In the future, we’ll blog about more intense water storage, but this will get you started.